Our vision is to provide you with the best family health care experience available. To fulfill this vision we employ the best nurse practitioners (NPs) in the industry. Nurse practitioners are already providing primary care in Canada to over 3 million people and are authorized to prescribe, diagnose, run tests and perform numerous procedures, among other functions. Why not take advantage of this dedicated group of professionals who are able to address most health concerns in our walk-in clinic located in downtown Toronto? HomeMD is proud to be Toronto’s only health care service built on combining technology with the compassion and expertise of nurse practitioners. For many years, these qualified health care professionals have been an untapped resource – with the advent of HomeMD, we plan to change the way primary health care is delivered in Toronto. We know health and well-being is at the top of the list of importance for most people today. There is no better way to attend to all your health concerns and requirements than with HomeMD – a user friendly, effective app that opens up the world of unlimited health care to you. Unlimited services are a key feature of all three of HomeMD’s platforms. From telehealth to home visits as well as coming into the clinic, your visits are unlimited. This level of service addresses many of the issues we face in healthcare today, including doctor shortages, follow up questions and appointments; as well as chronic health problems that require ongoing attention. Many people, in the face of a health scare, may turn to a purely virtual, WebMD-type of online service that may be impersonal or provide misinformation or an inaccurate diagnosis. Many people typically leave a WebMD online diagnosis confused and/or frightened by what they have read. Enter HomeMD with a personalized service for a full range of medical concerns; be it virtual or in person. Rely on us for online personal care combined with an in-person clinic model. Our multi-platform app is the best of both worlds – when you want to save time and have a minor concern that can be solved over video conferencing, go ahead and click the app! Alternatively, if you feel your issue is best addressed in person, simply walk in to our clinic for a visit with a personable, caring nurse practitioner who will address your concerns promptly, effectively and professionally. For an affordable monthly subscription fee, you will have unlimited access to all three of HomeMD’s platforms, including our medical walk-in clinic. By visiting any other type of medical walk-in clinic, wait times among other issues will prevent high quality service and may leave you dissatisfied with the level of care you received. In contrast, HomeMD ensures the highest standard of care, from the moment you walk through our front doors through to diagnosis and treatment. Our team of professional NPs has created a trusting, caring atmosphere where patients feel at home and in excellent hands. Welcome to the future of family medicine in Canada. 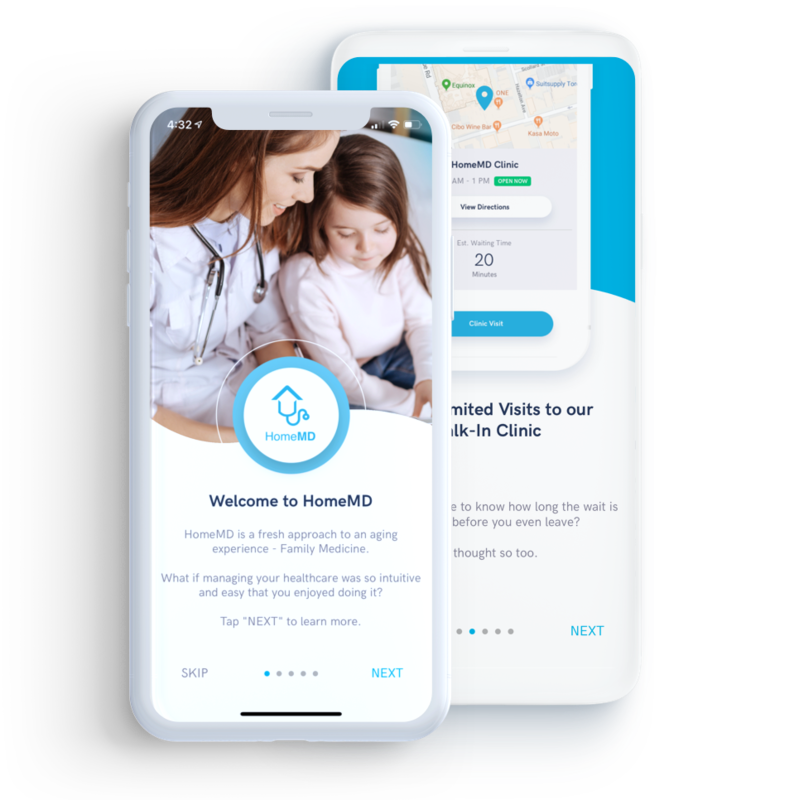 Now serving the mid-town Toronto area, HomeMD features a powerful new app offering a unique platform designed to make your life easier and healthier. In addition to Telehealth (video medical consultations) and home visits, we offer unlimited monthly visits to our state of the art walk-in clinic located in mid-town Toronto. This level of personalized medicine will connect you to our medical professionals in clinic, and help meet your healthcare needs in a caring, professional environment.For only $50 plus HST per month our all access plan will provide you with the following:– Secure digital access to all your medical records;– Unlimited home visits by our medical professionals;– Unlimited visits to our state of the art medical clinic conveniently located in mid-town Toronto;– Unlimited Video Consultations with our Medical Professionals.